What can strong brands accomplish? They can lead to increased distribution and sales. They can command price premiums. They can create emotional connections with customers. They can lead to greater customer loyalty. They can inspire customer advocacy. They can help attract and retain desirable employees. They can make it easier to enter new product and service categories. They can increase bargaining power in business negotiations. They can make it easier to transcend business crises. And they can increase stock prices and add to shareholder value. So, if brands are such valuable assets, it makes sense that they must be managed. And you can’t manage something without metrics. Which leads us brand equity measurement. First, let’s define brand equity. Brand equity is the value that a brand brings to its branded entity and that entity’s products and services. I outlined the elements of that value in the first paragraph of this article. So, what then should we measure? 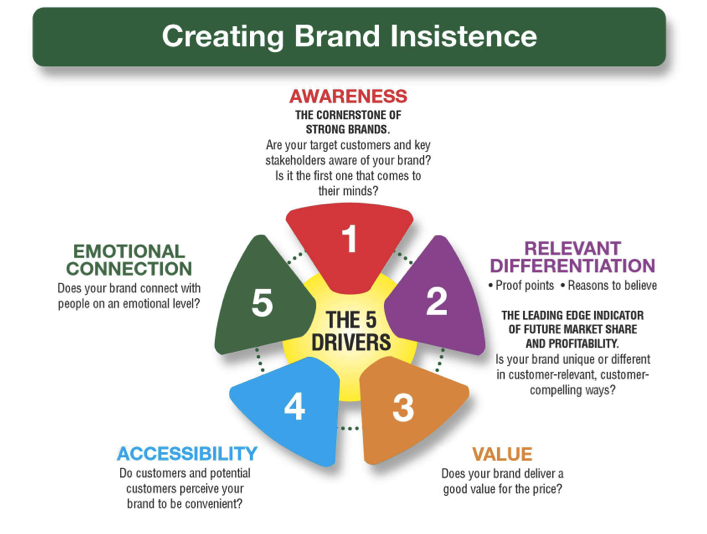 I have spent years refining and validating a brand equity measurement system that measures the five drivers of customer brand insistence – awareness, relevant differentiation, value, accessibility and emotional connection. Awareness is the cornerstone of strong brands. Awareness must be present for all of the other factors to come into play. Awareness is strongly correlated with brand preference and brand quality perceptions. We have found that open-ended questions measuring first recall and other recall top-of-mind brand awareness within specific categories are the most predictive measures of awareness. We can also measure brand awareness associated with delivery against specific customer benefits. We also ask the close-ended brand familiarity question. Most brand equity measurement models measure relevant differentiation and ours does too. We measure relevance within particular product categories and we can measure relevance against specific customer needs. We also measure the importance of up to 24 customer benefits and shared values. The benefits can be functional, emotional, experiential or self-expressive. We also measure the brand’s perceived delivery against these 24 benefits and shared values. We then plot benefit importance versus delivery on a radial coordinate chart creating a brand positioning map. We overlay the same information for up to three of the brand's most important competitors to identify brand positioning opportunities and threats. Further, because brands are owned in the minds of customers, we ask an open-ended question or two about top-of-mind brand associations and differentiators. We hand code and quantify the responses for highest accuracy. Few other brand equity measurement models measure this. Value has a numerator and a denominator. The numerator consists of the bundle of benefits the brand delivers. The denominator recognizes that there are financial, time and other costs to receiving those benefits. Value can be understood as the ratio of these two. We measure perceived value of the brand. We also measure perceived quality of the brand. Accessibility is most important for location-based brands (retail, restaurants, etc.) but is important to some degree in every category. Accessibility comes into play when a customer has to decide between a preferred brand that is less accessible and another brand that is more accessible. When the difference in accessibility between brands is significant, people often choose the more accessible brand. Many academic disciplines have demonstrated that, even though we might consider ourselves to be highly rational, we are still largely driven in our decisions by our emotions. This is true not just for consumer brands but also for business-to-business brands as well. We have four distinct measures of brand emotional connection. Each one measures a more intense emotional connection. 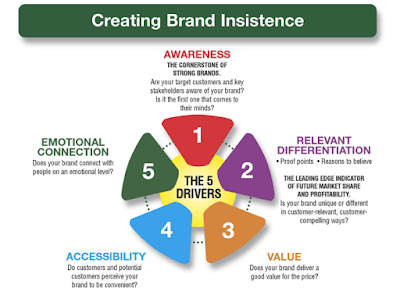 These five brand insistence drivers work in the following way. 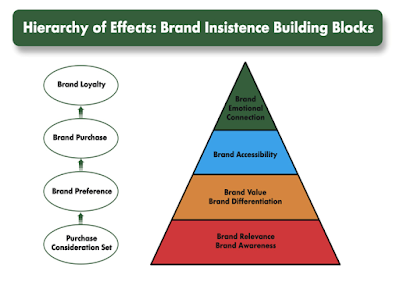 Brand awareness and relevance may lead to the brand’s inclusion in the consideration set. Brand differentiation and value may lead the brand being preferred. And brand accessibility may lead to brand purchase. 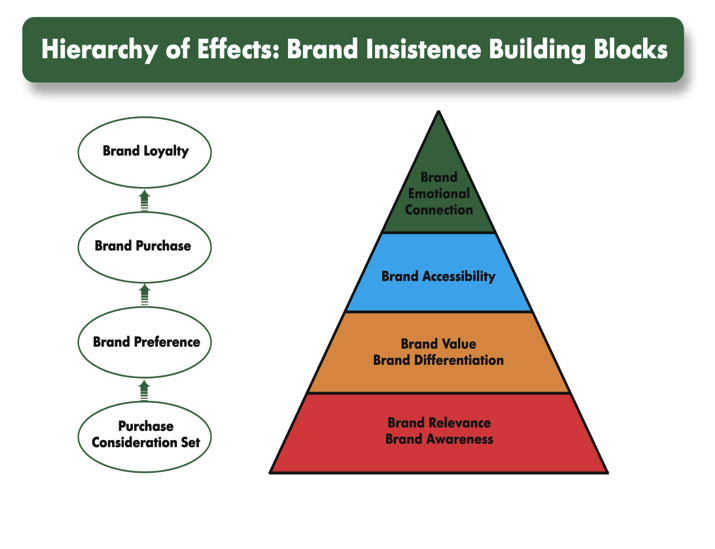 Emotional connection to the brand may lead to brand loyalty and advocacy. Our brand equity system also measures customer loyalty (two common and well-validated measures of attitudinal loyalty: (1) Would you recommend this brand to a friend? and (2) Knowing what you know now about the brand, would you use this brand again? The system also measures brand personality (against a large battery of personality attributes), other brand associations and brand vitality (two measures). Understanding that brands do exist in a vacuum but rather in a competitive environment, our brand equity measurement system measures each of these components not only for our clients’ brands, but for their competitors’ brands as well. Note: BrandInsistence(SM) is a proprietary brand equity measurement system developed by Brad VanAuken and offered exclusively by BrandForward, Inc.
You can read more about this in Brand Aid, second edition.